Four owners of 33 U.S. daily newspapers have sought Chapter 11 bankruptcy protection in the past 2 1/2 months. A number of other papers are up for sale. 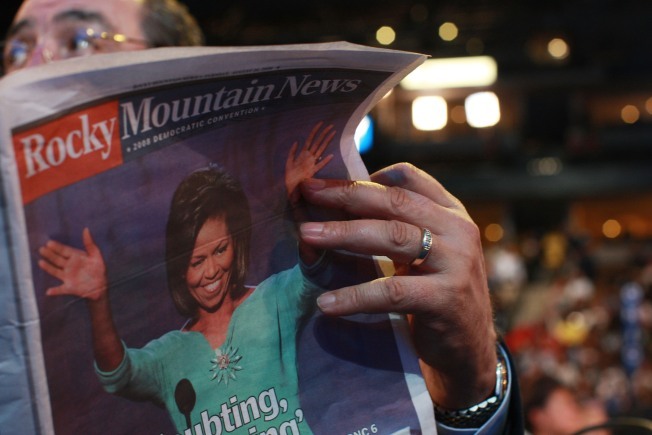 DENVER -- The Rocky Mountain News will publish its last edition Friday. Owner E.W. Scripps Co. announced on the newspaper's Web site Thursday that its search for a buyer for the paper was unsuccessful. "Today the Rocky Mountain News, long the leading voice in Denver, becomes a victim of changing times in our industry and huge economic challenges," Scripps CEO Rich Boehne said. Scripps said the paper lost $16 million last year. Financial problems are widespread in the newspaper industry as the economy has deteriorated, ad revenue has tumbled, readers have gravitated toward the Internet and advertisers have followed them. This past weekend, there were separate bankruptcy filings by New Haven (Connecticut) Register publisher Journal Register Co. and by the owners of The Philadelphia Inquirer and the Philadelphia Daily News. They followed a December filing by Tribune Co., whose media stable includes the Los Angeles Times and the Chicago Tribune, and January's filing by the owners of the Star Tribune in Minneapolis. Other publishers could seek bankruptcy protection in the coming months, too, as advertising prospects for 2009 remain bleak. Hearst Corp. announced earlier this week it will close or sell the San Francisco Chronicle if it can't reduce expenses dramatically within the next few weeks. Last month, Hearst laid out plans to close the Seattle Post-Intelligencer if a buyer isn't found before April. And Gannett Co. is looking for a buyer for the Tucson Citizen in Arizona. Boehne said the paper's 230 editorial employees would be paid through April 28. The Post said it will hire 10 News staffers, including five columnists, four reporters and the editorial page editor. Scripps announced on Dec. 4 it would try to sell the paper. Only one potential buyer came forward, "and that party was unable to present a viable plan," the company said. Scripps has owned the News since 1926. The paper will close just two months short of its 150th anniversary. Since 2001, the News has shared business operations with The Denver Post in a joint operating agreement between Scripps and The Post's owner, MediaNewsGroup Inc.
MediaNews said Rocky Mountain News subscribers will get The Post for the length of their subuscriptions and The Post will return to seven-day publication starting Saturday. Under the JOA, The Post published Sunday through Friday and the News published Monday through Saturday. "The Rocky will forever be remembered for its vital role in the city's history and the city's success," said William Dean Singleton, chairman and publisher of The Post and CEO of MediaNews. "Although we competed intensely, the talented staff of the Rocky earned our respect with each morning's edition." Singleton is also chairman of the board of The Associated Press. Scripps said it has been working with MediaNews on "a plan to unwind the partnership" since mid-January, the deadline for offers. The future of the Denver Newspaper Agency, the entity that handles the two newspapers' business operations, was unclear. The agency is a 50-50 partnership of the News and The Post. Scripps said it will retain ownership, and still offer to sell, the Rocky Mountain News name and the newspaper's archives and Web site. Ed Atorino, a newspaper industry analyst at The Benchmark Co., said that indicates the News could become an online-only paper at some point. "On-line newspapers seem to be doing pretty well," he said. "It's a very low-cost business."